Judging from the bursts of laughter in the dining room (including the conspiracy of the women at the table to go to Las Vegas for the weekend, and chef’s need to drive a guest home) last night’s Cozinha Portuguesa was a great success. Special thanks to guest GA, who was kind enough to bring both a 1963 and 1958 Sandeman Vintage port for the crowd. It was a fabulous opportunity–and an incredibly gracious offering from our guest. Cheese course: Serra da Estrela (guests asked for seconds on this amazing creamy cheese from the Northern parts of Portugal); Sao Jorge, a cheddar-like cheese from the Acores. Served along with mom’s marmalada, or quince paste, which is similar to Spain’s membrillo. Maybe next time I’ll hire a photographer…anyone willing to photograph for food? I think bartender/barista/front-of-the-house husband snapped off a few pictures. I’ll check to see what he came up with. A great MANY thanks to JJ, who flew up from San Diego to help out in the kitchen and, importantly, in the post-mortem clean up. The house is all back to normal like nothing ever happened. Now, gearing up for another one (this time a “commissioned dinner”–a request by group) on May 8. Growing up, I would anxiously sit through the long Mass on Easter Sunday, fidgety in my itchy lacy Easter dress. 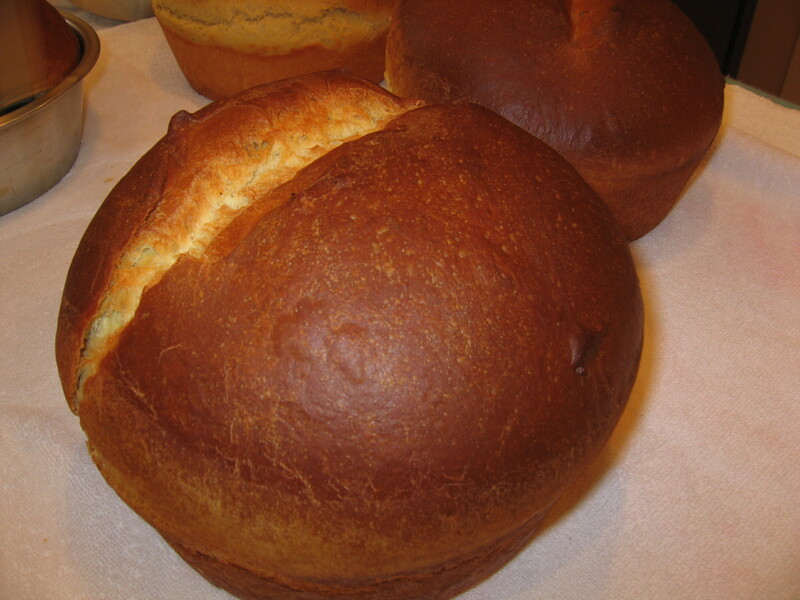 And my mind was focused on one thing: Portuguese sweet bread (massa sovada, which means leavened bread). Typically my mother (and every Portuguese woman we knew) would make vast quantities of it and distribute it to family, friends and neighbors. So we would have a collection of breads on our kitchen table. But my mom’s was and still is the very best. Most years, I make it with my mom because it’s a tradition I definitely want to keep. Without kids we have no one on whom to pass the recipe or the tradition. So with that in mind, I am going to document the process. Please note that this makes QUANTITY bread–enough to share as holiday gifts with friends, family and neighbors. 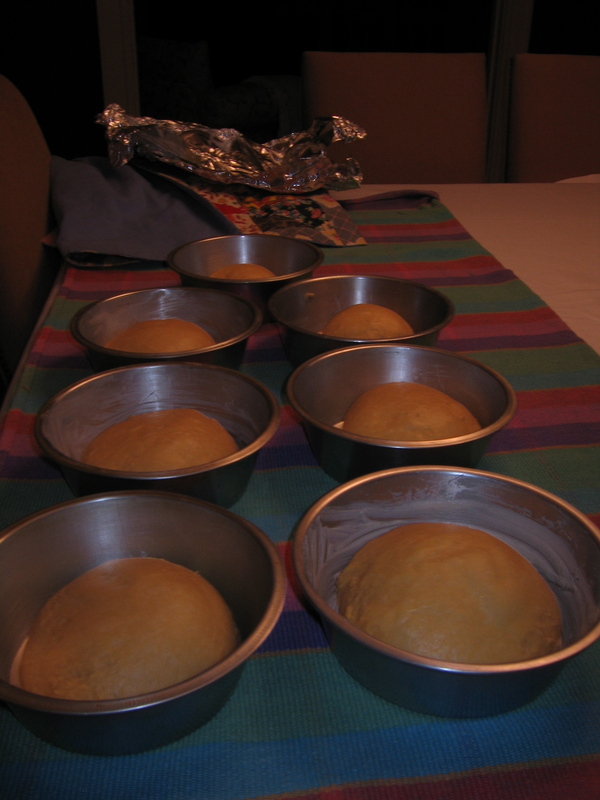 This recipe made seven loaves, which we distributed. 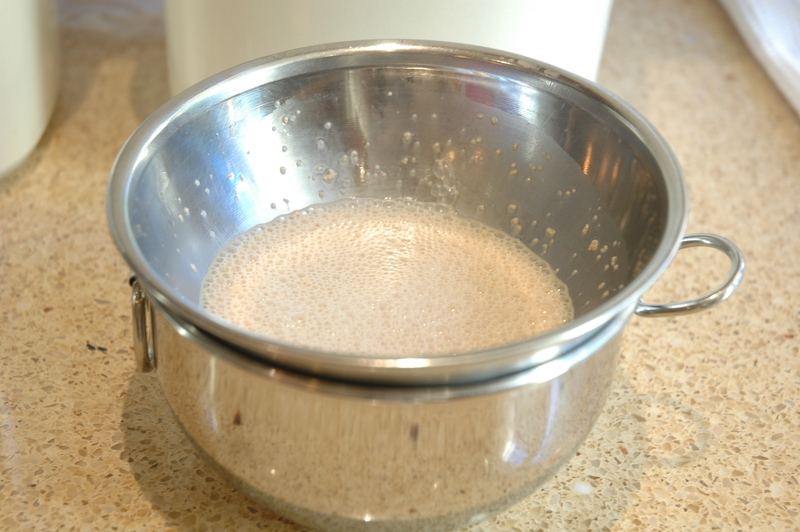 To make the starter: Mix the yeast with 3/4 cup of the warm water and a pinch of sugar and let “proof,” meaning you’re making sure the yeast is active. 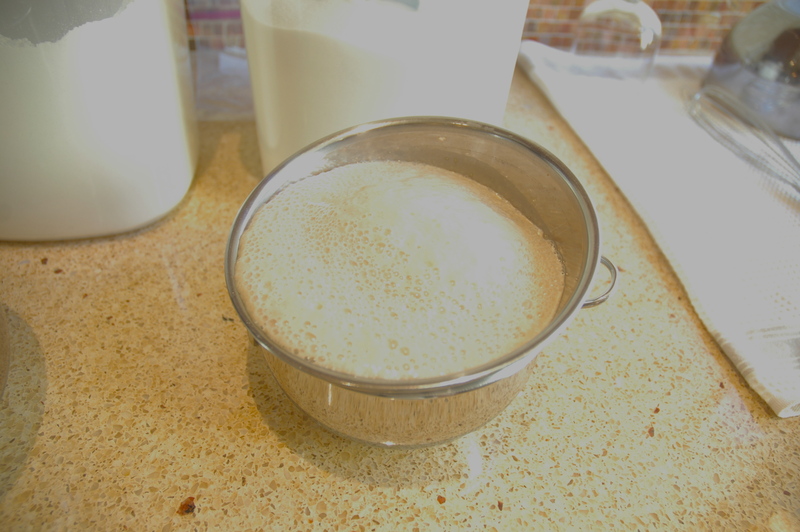 The yeast will start to “eat” the sugar and it will bubble up. Then mix together the rest of the ingredients and set aside in a warm, draft-free place. Allow it to bubble up and double in size. For the bread: Sift the flour into a LARGE pan (ours is about 24 inches in diameter; you can usually get them at a restaurant or bakery supply warehouse). 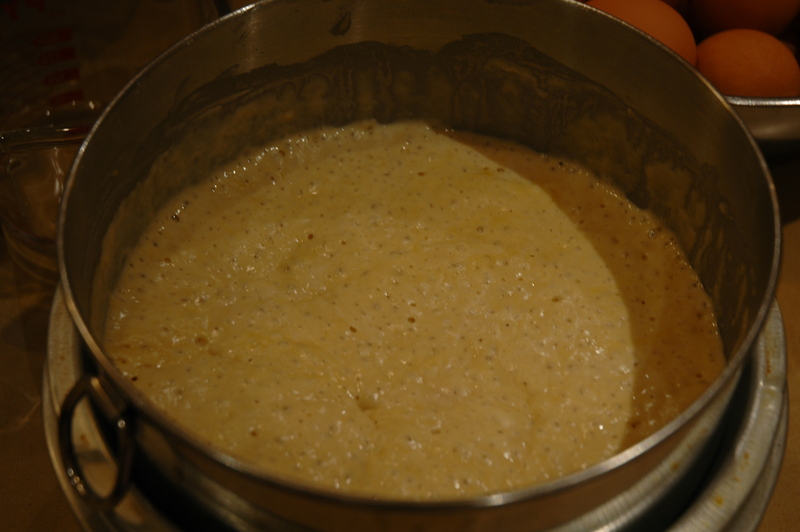 Add the proofed yeast mixture. 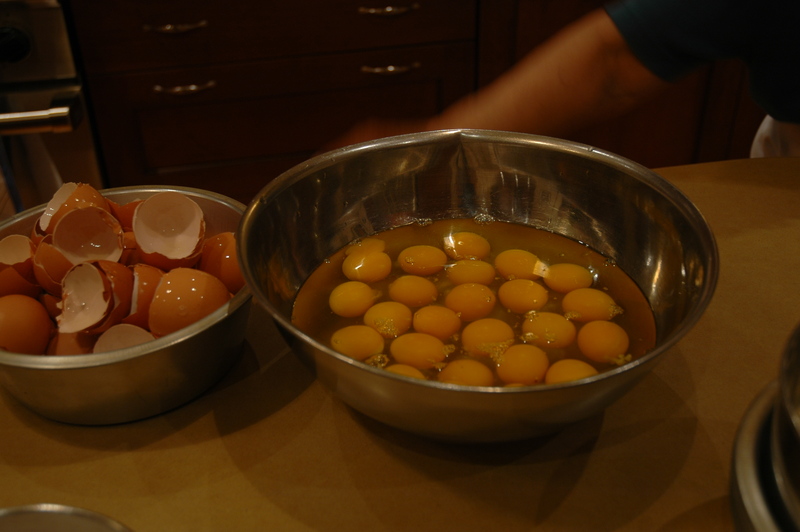 In a large bowl crack the 24 eggs, add the sugar and sweetener and beat well. Add the beaten eggs and sugar to the flour in the pan. 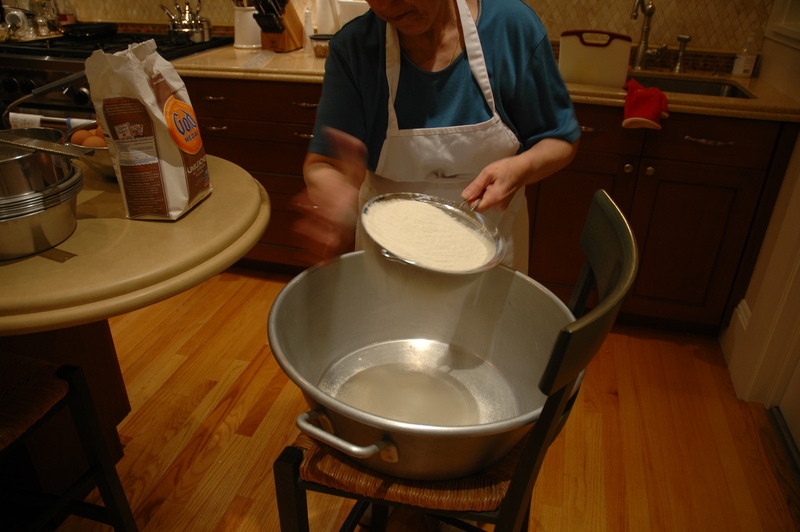 Use your hands to integrate the liquid ingredients with the flour until a rough dough is formed. Now you’re ready to start kneading. 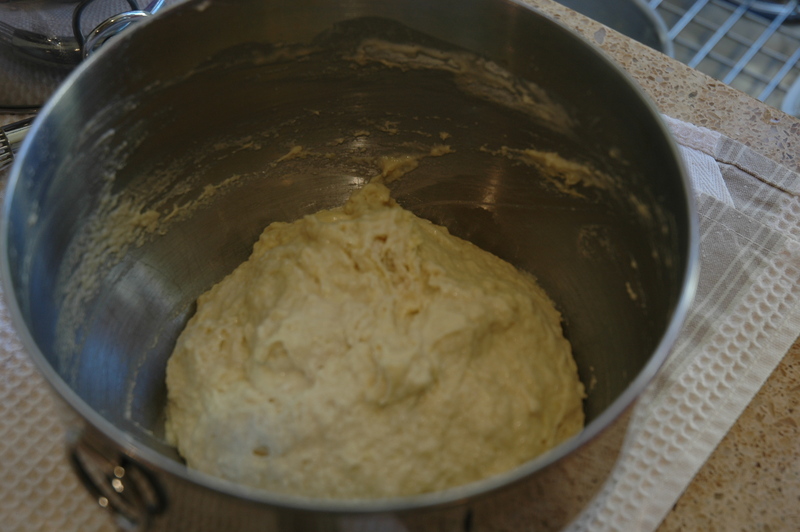 Start kneading the dough with closed fists, adding a little bit of melted butter to the bowl when the dough gets dry. (This is like the dough version of risotto.) 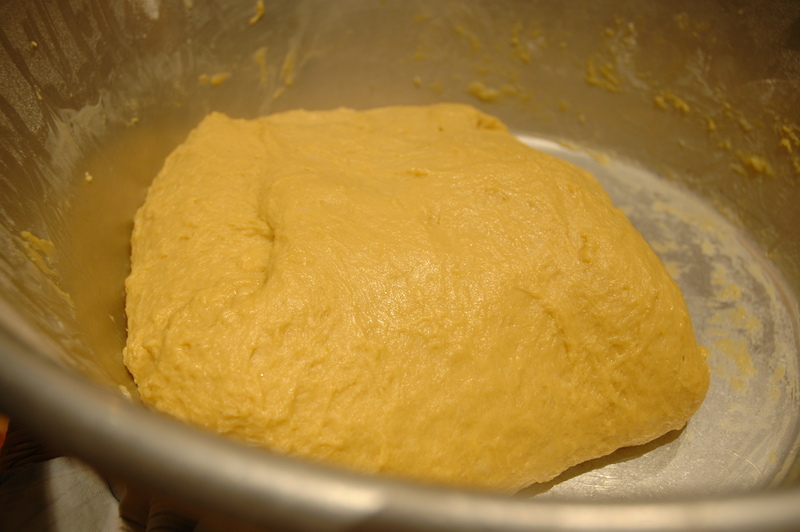 Continue adding a little bit of butter at a time, kneading the dough in between. Please note how you knead major quantities of bread. 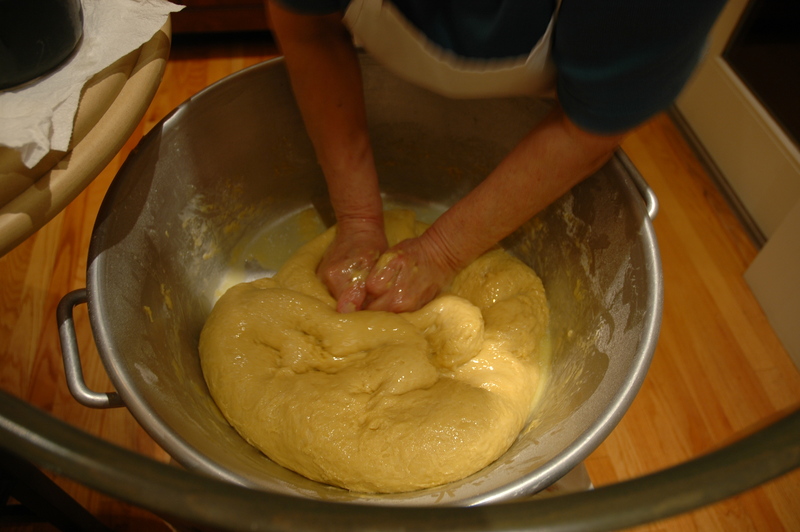 You don’t slap the entire mass onto the counter and knead with your palms, like in most small-scale bread recipes. When all the butter is incorporated, place aluminum foil over the bowl, and wrap the bowl in blankets and place in a warm, draft-free place. Typically we do this the night before we bake. 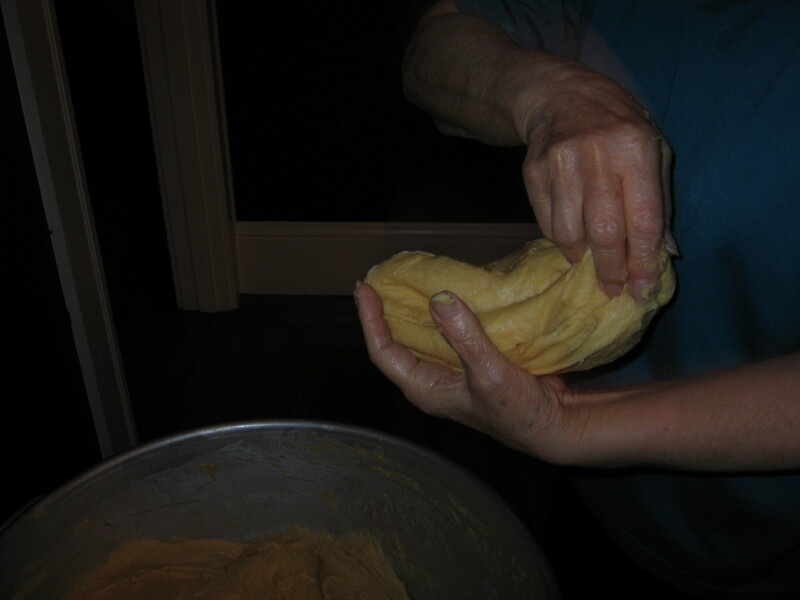 We put the dough to bed around 10 p.m. At 5 a.m., my mother’s soft knock on our bedroom door alerted me that it was time to make the loaves. 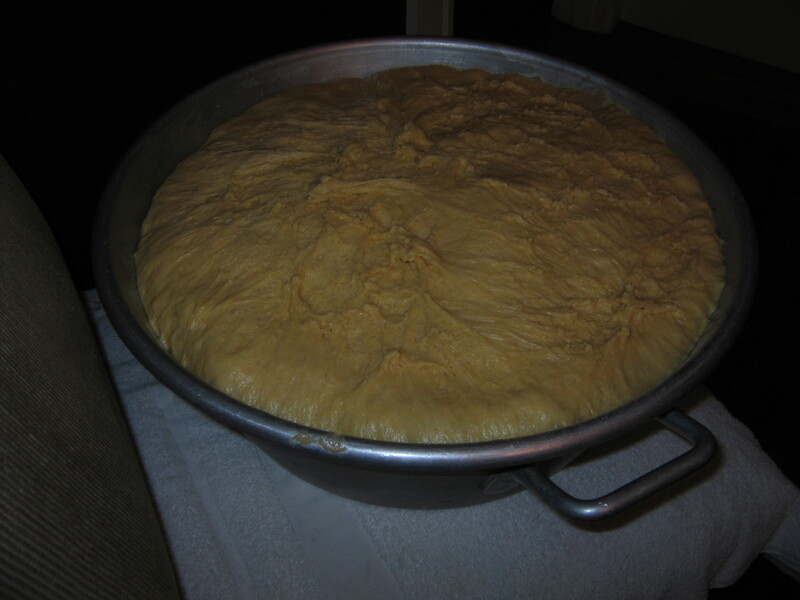 The dough had filled the pan. 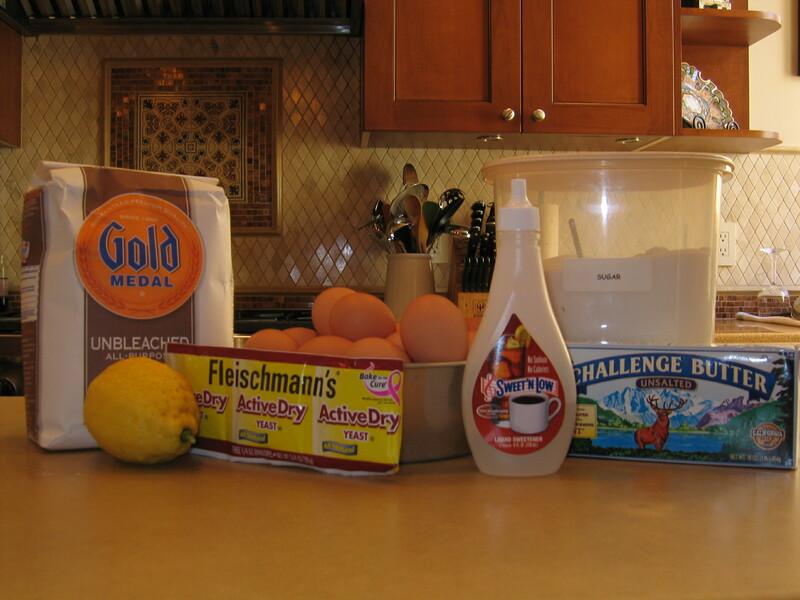 Butter and flour the pans. 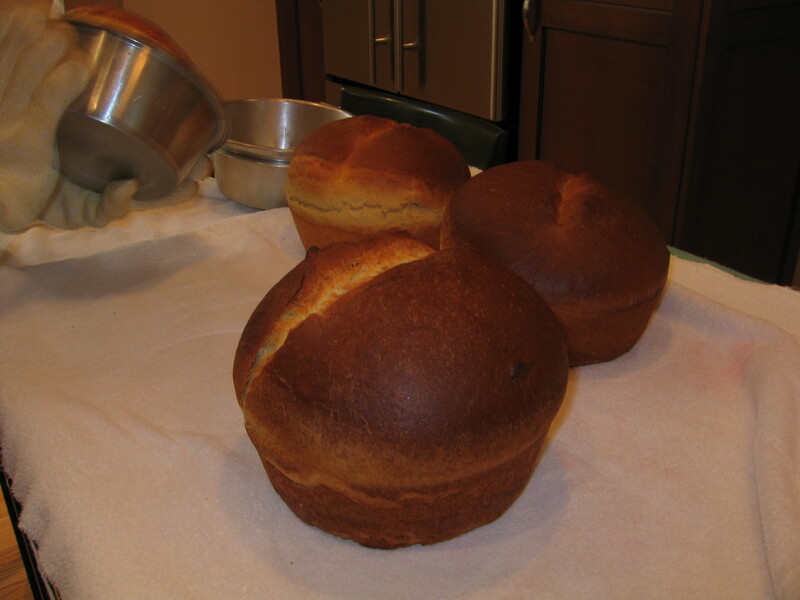 After making the loaves, we lay a blanket over them (not too heavy, lest they be compressed). These rose for another two hours. At 7:30 a.m., we heated the oven to 350 degrees. We could fit three loaves in the oven at once. They baked about 45 minutes for each batch. It’s tempting to each them hot out of the oven, but WAIT. 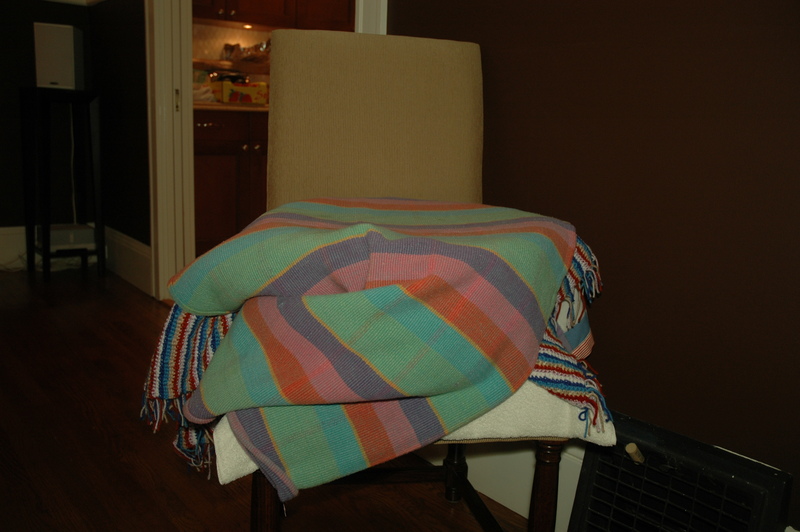 Lay down a light blanket or clean towel over them to let them rest. You can let them cool without the blanket but that will result in a harder crust, which you don’t really want with this kind of bread. Bread can be eaten warm within an hour or so. *about the sweetener: there’s something about the sugar in Portugal vs. the American sugar that makes Portuguese sweet bread much heavier here than there. My mother’s solution is use some artificial liquid sweetener to add some sweetness without the weight or density. Typically, I avoid all laboratory products in my cooking but this is an exception and has great results. You won’t have any aftertaste, I promise.